The cool wet summer continued into August. As in July, there was no dry warm settled spell in August. While the mean temperature of August was similar to July, the highest temperature of August was five degrees less. The rainfall in August was 20% less than July but it rained in 24 days in August compared with 21 days in July. Towards the end of the month, with lower temperatures, there was more than a hint of the approach of autumn. 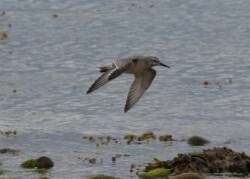 Having said that, summer visitors were still to the fore including: seven Common Sandpiper on Sliddery Shore on 1st, six Blackcap and two Sedge Warbler by Corriecravie Pond on 2nd, a Swift over the Knowe on 3rd, a juvenile Cuckoo at Torr Righ Beag on 7th, eighty Swallow at Clauchlands on 8th, fifty House Martin at Lagg on 10th, fifty Sand Martin at Fuar Achadh on 15th, two Tree Pipit at Carn Ban on 27th, a Willow Warbler in Kilmory also on 27th and a Whitethroat at the Fallen Rocks on 30th. Please try to give me your last record for Swallow and House Martin this year. Last year there were October records for both species. Some signs of successful breeding this month included: Mute Swan with two young at Pirnmill on 1st, juvenile Water Rail at Corriecravie on 2nd, juvenile Great Spotted Woodpecker in Kildonan on 12th, female Eider with two young Brodick Bay on 13th, juvenile Collared Doves in Kilpatrick on 15th, second brood of Blackbird in Machrie on 21st and a family group of Buzzard over north Newton on 30th. In August, breeding is coming to an end, and after breeding a number of species begin to flock together, some in preparation for migration. These included: fifty House Sparrow at Kingscross on 4th, one hundred and eighty-three Jackdaw at Drumadoon on 7th, sixty Curlew at Clauchlands on 8th, seventy Starling at High Kildonan on 15th, twenty-four Red-breasted Merganser at Cosyden on 17th, two hundred Goldfinch at East Bennan on 26th, a thousand Kittiwake in Whiting Bay also on 26th, two hundred Linnet at Levencorroch also on 26th and on 27th one hundred Golden Plover and fifty Turnstone at Machriewaterfoot. All around the coast were signs of birds on migration, including: two Whimbrel on Sliddery Shore on 1st, a Merlin on the Holy Isle on 7th, a Sanderling at Drumadoon Point also on 7th, a Great Skua and 1,000 Manx Shearwater off Largymore on 14th, four Sandwich Tern at Clauchlands on 20th, fifty Redshank in Whiting Bay on 26th, six Dunlin and one hundred and fifty-nine Ringed Plover at Machriewaterfoot on 27th, two White Wagtail at Porta Buidhe on 28th, four Knot at Drumadoon Point also on 28th, a Bar-tailed Godwit at Torrylinn on 29th, two Wheatear in Auchenhew Bay also on 29th and a Black-throated Diver off Leac Garbh on 30th. Among the one hundred plus species reported in August there were a number of other noteworthy ones. 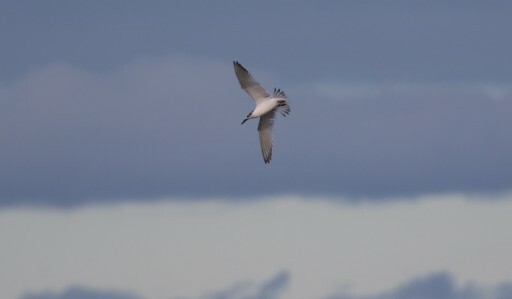 These included on 30th one hundred Gannet off Laggan and two Goosander at the mouth of the Iorsa. Plus, after no records in 2016, there were twenty-one records of Kingfisher in August from five locations including Brodick pier. 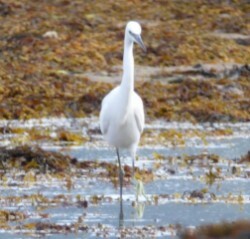 In addition there was one exceptional sighting in August, a Little Egret. This was only the second ever record of this species on Arran and it was reported in both Lamlash Bay and Whiting Bay between the 4th and 7th of August inclusive. 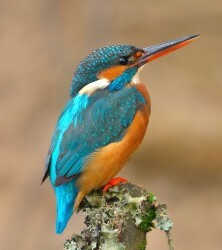 The next bird note in the "Banner" will feature this species. 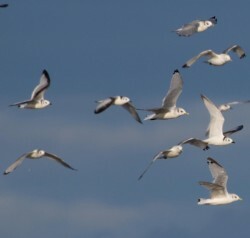 September sees the start of the peak migration season when many birds are on the move. It is the time to expect the unexpected. I look forward to hearing from you.